Noble's Pond features modern amenities, attractive homes and a charming Americana flair. Noble's Pond was opened in 2007, by Regal Homes, with plans for approximately 800 homes in both attached and single-family designs. The community is still in development and interested homebuyers can choose from available resale or new construction homes. With a setting in Central Delaware, the community enjoys all four seasons. 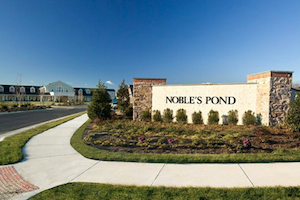 The prime location also puts Noble's Pond residents within 90 minutes of several popular East Coast destinations, including Baltimore and Philadelphia. Atlantic Coast beaches are about half that distance away, putting beautiful coastal shorelines just a short drive away for a relaxing day trip or weekend retreat. The Point, a 28,000 square-foot clubhouse, brings residents together with a variety of indoor and outdoor amenities. Elegant rooms offer an ideal place to socialize, either with small groups of friends or as part of a larger planned activity. The Conservatory is a cozy, fireside lounge, while the Gathering Point Ballroom provides a versatile space for many different community events. For informal gatherings, residents can meet in the cozy library or have some fun in the billiards and game room. 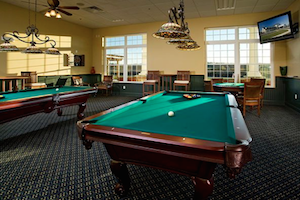 Residents at Noble's Pond enjoy gathering in the game room for some friendly billiards or cards. Outdoors, the spacious patio and grill area welcome friendly get-togethers, while the resort-style pool is an ideal place to cool off on a hot summer day. Community gardens appeal to residents who want to nurture their green thumbs, and nature trails provide a beautiful setting for daily walks. There are also bocce ball courts, horseshoe pits and a putting green. When it comes to residences, Noble's Pond offers both attached carriage homes and detached single-family designs. Carriage homes are thoughtfully designed for low-maintenance living with floor plans ranging in size from approximately 1,100 to 1,482 square feet. Models typically include two bedrooms, two full bathrooms and an attached one-car garage. The Springfield model has an option for an additional half-bathroom, and the Brandywine Deluxe model has a two-car garage. Single-family homes are designed for main-level living with floor plans ranging in size from 1,360 to 2,190 square feet. Homes typically include two or three bedrooms, two full bathrooms and an attached two-car garage. Some models also have a separate den, while the Princeton model has a smaller, one-and-a-half-car garage. Charming homes, an elegant clubhouse and a prime location come together to make Noble's Pond an attractive option for active adults who choose to settle in Central Delaware.